KIT.IN.DRY de CLIMATAINER is the high-quality thermal isolation upholstering of maritime containers. Transforms a DRY container into isothermal container. All the walls of the container are upholstered with insulating slabs. Permits the replacement of the reefers or containers cooled in certain cases. Constituted of FLH (Foil Laminated Honeycomb) panels 60 mm or 30 mm thickness. Blocks heat transfers due to its reflective properties which limit the radiation and in concert with the other materials and assembly reduce other heat transfers. Mechanical resistance limiting shocks during transport. Ensured by our approved padding centers, located in Europe. 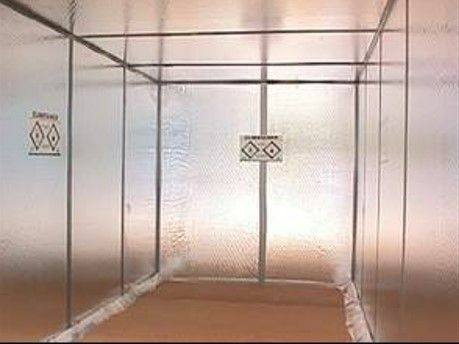 The centers are held tot very strict specifications which permits us to guarantee the absolute reliability of the thermal isolation of the container. Option to self-assemble, including the upholstering by following the instruction guide. 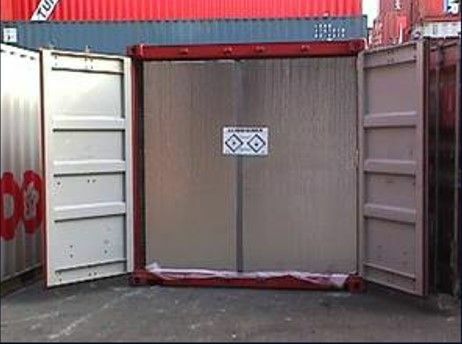 Designed for standard models of maritime containers 20 ‘, 40 ‘ or 40 ‘ Cubic High (or other models of container on request). Constituted of fully recyclable materials the sustainable development policy of the company will be low-fat investments time and infrastructures. From the transport data communicated by the customer (place and temperature of the loading, destination, nature of the product, time of the year, zones crossed etc.) our digital simulation software (in collaboration with CNRS) provides the optimal solution. Our product panels are made with 60mm thick foil-laminated honeycomb cardboard. CLIMTAINER product ensures the thermal protection of your goods during the transport. It’s system is elaborated for the efficiency of the results in respect with the environnemental protection. No heat radiation – double-sided aluminium screen stops over 96% of heat loss/gain due to radiation. Example : survival blanket used in extreme sports are typically made of aluminium sheets. Provides a barrier against heat loss/gain through conduction. In nature, the highest performing insulator after a vacuum, is the still air. The thicker the insulation layer, the better performance you get. In this case, air is trapped in cells within the honeycomb core. Example : double-glazing uses the air thickness. The prevention of air movements further prevents thermal exchanges. RECYCLABLE – it is primarily made of cardboard. ECONOMICAL – it does not consume energy (contrary to the reefer). NON POLLUTING – it uses non-toxic aluminium adhesives (starch, vinylic). EASY TO ASSEMBLE – everything is in kit form ready to use.